Saint Monica was born to Christian parents in AD 332 at Tagaste, a town now known as Algeria in Northern Africa. 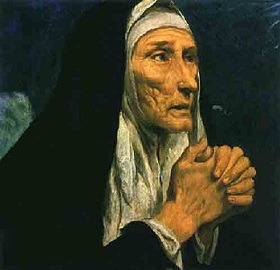 As a child, Saint Monica was known for her kindness to the poor, her sensitive conscience, and for being a peacemaker. When she was 20 years old, Saint Monica’s Christian parents arranged for her to get married to a pagan man, Patricius, who was 10 years older. He was a municipal councillor in their town. Patricius was a man of dissolute habits just like the ordinary pagan of his time. Saint Monica suffered a great deal from his mean temper and infidelity. Adding to her burden was her possessive mother-in-law, who also was of a similar disposition as her son. Patricius was an only son and he and Saint Monica shared the household with his mother. Her mother-in-law was jealous of Saint Monica who now ran the household. Even the servants sided with Saint Monica’s mother-in-law. Poor Saint Monica! How did she bear all these? She lived out in her life the saying, “If they throw you a stone, throw them bread.” This was evident in her loving service and patient endurance. Her love eventually won over her mother-in-law and gained her the respect of her husband. Saint Monica and Patricius had two sons, Augustine and Navigius, and a daughter, Perpetua. Navigius got married and had two daughters and a son, all of who entered the religious life. Perpetua also got married but was widowed. Eventually she joined a monastery where she became an abbess. A prayerful woman, the Lord rewarded Saint Monica’s many years of fervent prayers and sacrifices offered for the conversion of her pagan husband. He was baptized and became a changed man. He became a chaste husband, a devoted father and a practising Catholic. But Saint Monica’s joy was short-lived when her husband died a year after his conversion, leaving her a widow at just 40 years of age. Of her three children, Saint Monica’s eldest son, Augustine, gave her the most number of reasons to weep and pray to God. Though a brilliant child, Augustine admitted that he was wayward and lazy, as he wrote in his book, Confessions. He did not like to study and was often beat up by other students at school. Patricius and Saint Monica dreamt of Augustine becoming an educator. So they scrimped and saved for his education. Later on, we will come to know how Augustine’s God-given intelligence and acquired learning were put to use for the Lord in a powerful way. The Lord anointed Augustine to become one of the leading defenders of the Faith and a significant theologian of his time until this very day. Soon after his father died, Augustine moved to Carthage to pursue his studies. This 17-year-old boy was fascinated and easily influenced by the big city life. He frequented the games and the theatre. He indulged in these pagan hobbies and lewd religious practices. He lived with a woman and had a son with her. 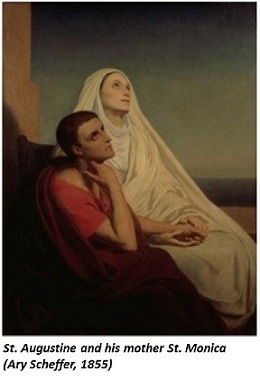 Saint Monica was concerned about her son’s illicit relationship but she was more disturbed by his involvement in an outlawed religion – Manicheism. Manicheism took elements of Christianity and distorted them. This religion taught that special knowledge and a certain way of life were needed in order to be saved. The Bible was dismissed as full of contradictions. Followers of this religion found the idea of God being born of a woman and dying on a cross totally repellent. They gave importance to diet and avoided eating meat, fish and eggs. They believed wine was the bile of demons. The followers only ate fruits, vegetables and grains. Augustine was an enthusiastic disciple and eager to share his newfound religion. 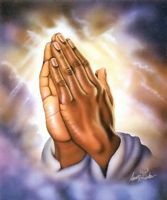 At that time, many Christians did not know the grave differences between Christianity and Manicheism and practiced both. For Saint Monica, Augustine was spiritually dead. Apart from fornication and adultery, his denial of the truth of the Gospel was ultimate death. Meanwhile, Augustine excelled as a teacher of rhetoric. But despite his success, he decided to go to Rome. He believed that in Rome things would be different. Saint Monica trusted in God’s grace of detachment. Augustine secretly sailed to Rome and left her, and she cried out to Him all the more in her suffering. Unknown to mother and son, God’s plan for Augustine’s conversion had begun. 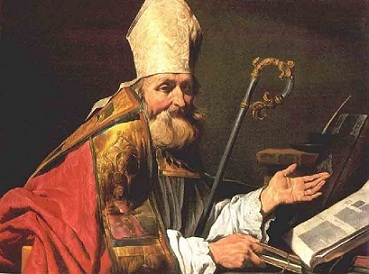 Augustine eventually got tired of Rome and took up a teaching position in Milan. In Milan, Augustine met Bishop Ambrose. The bishop was known for his goodness and eloquent style of preaching. Augustine, a professional speaker himself, was impressed by him and went to church to listen to him. Saint Monica followed Augustine and arrived safely in Milan. In her journey, she braved the storms and thought only of being reunited with her son. Augustine welcomed her with the news that he was no longer a Manicheian. Meanwhile, Augustine’s faithful mistress for 14 years was sent back to Africa and it was said that she took a vow of celibacy. Their love-child remained with Saint Monica and Augustine. Saint Monica met the providential angel, Ambrose, whose saintliness greatly influenced her and Augustine. She became warmer and gentler, while her son gave up his wayward ways and was at peace. On Easter Sunday in 378, Augustine and his son, Adeodatus, were baptized with some of his friends in attendance. After the great event, they set out on a journey back to Africa. Unfortunately, Saint Monica became ill and died during the trip. She was 53 years old and was laid to rest in Ostia. Like Saint Saint Monica, let us trust the loving goodness of the Lord and always ask for His help that He may strengthen us amidst the trials of our daily life. Click here to return from Saint Monica to Catholic Saints.